Hidden Valley Resort located at 1 Craighead Rd, Hidden Valley, PA. 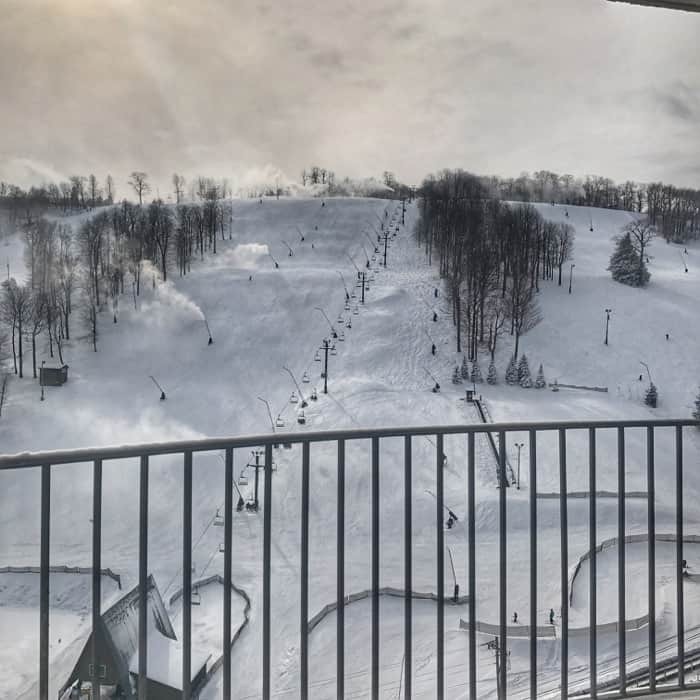 This resort is known for being a great place for families and those who are new to skiing or snowboarding. 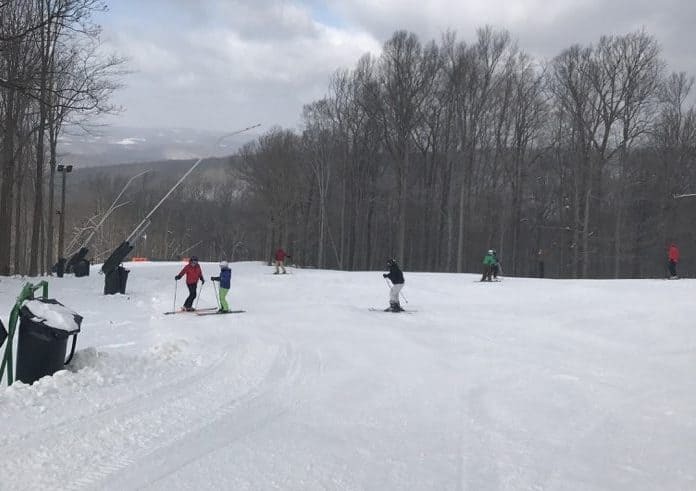 With 26 slopes and trails and two terrain parks on 110 skiable acres, there is something for everyone. If you are new to skiing or snowboarding, take the lesson. Friends don’t let friends give each other lessons. Trust me on this one, it is so much less stressful if you are learning from an instructor. Hidden Valley Resort offers a different technique for their newbies called Fun Based Learning that allows participants to focus on “going” rather than “stopping.” The instructional course is designed in such a way, that it makes it easier to control your speed, stop, and turn. 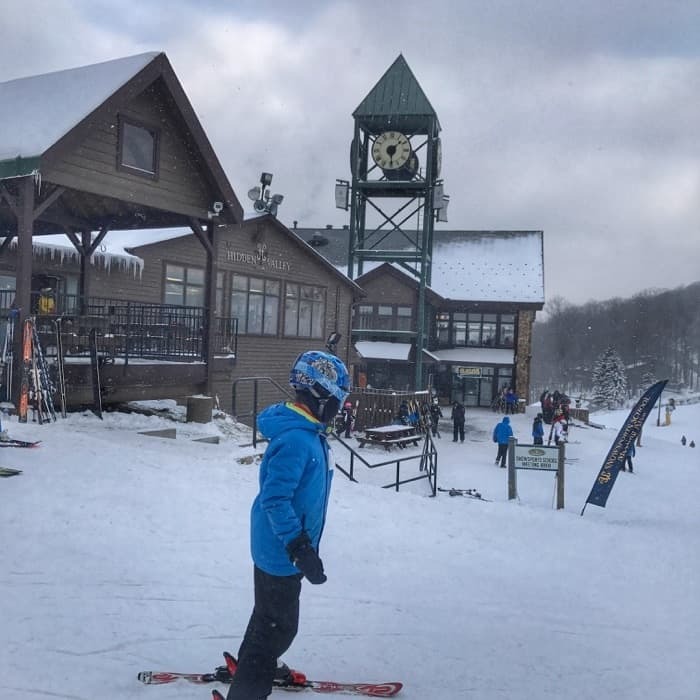 A few of us took the lesson as a refresher, (it was my first time skiing this season after braking my ankle a few months earlier). 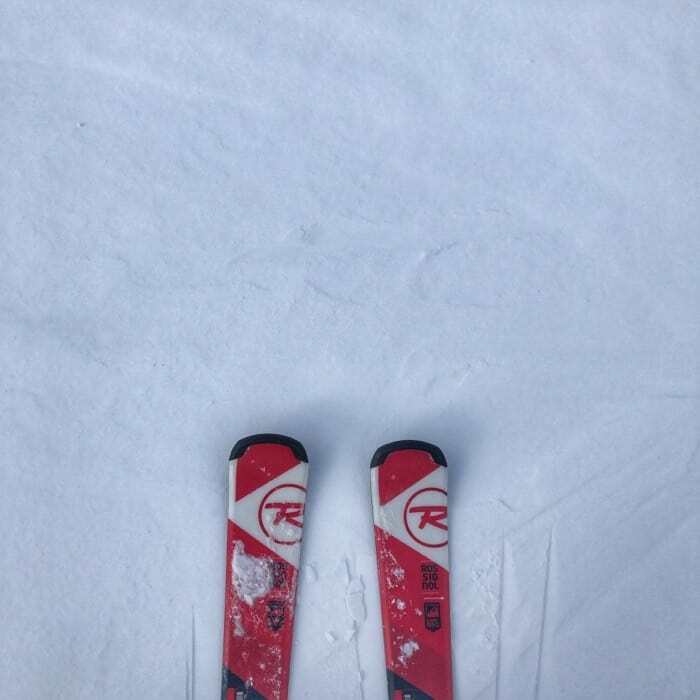 There is always something to learn and improve on no matter how long you have been skiing. 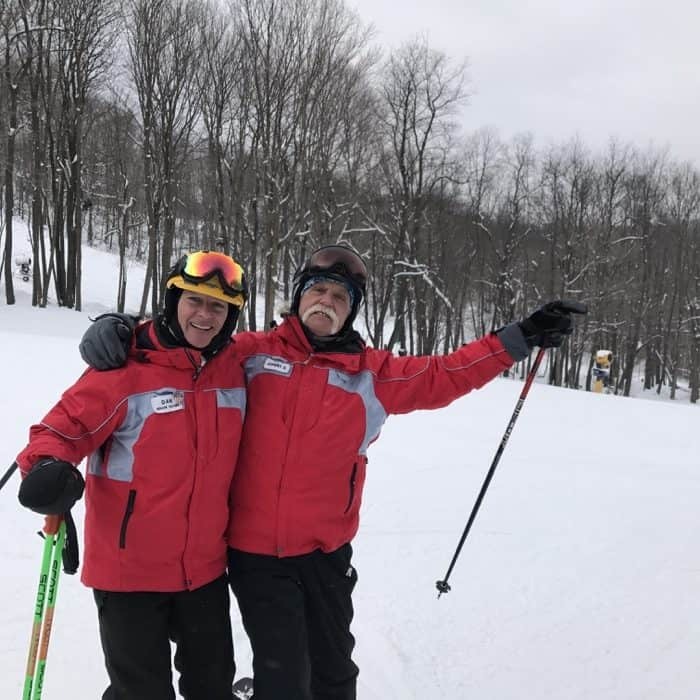 Our instructors, Dan and Johnny, did a great job showing us what to do and encouraging us to push ourselves to do more. This is a great place to start if it’s been a while since you’ve been on skies or a snowboard. 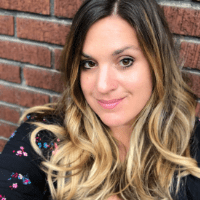 If you are a family with younger children, I would recommend checking out the Lil Rippers program (ages 3-12). It’s designed to teach them how to ski or improve on advanced skills. 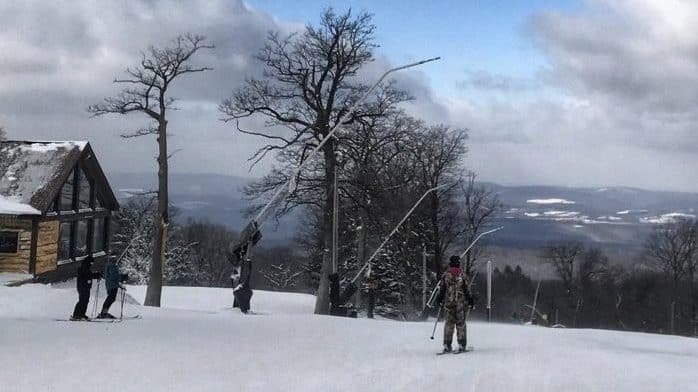 You have a half day or full day option includes lunch which will allow you to either take a lesson or enjoy some time on the slopes on the tougher Black Diamond or Blue runs. 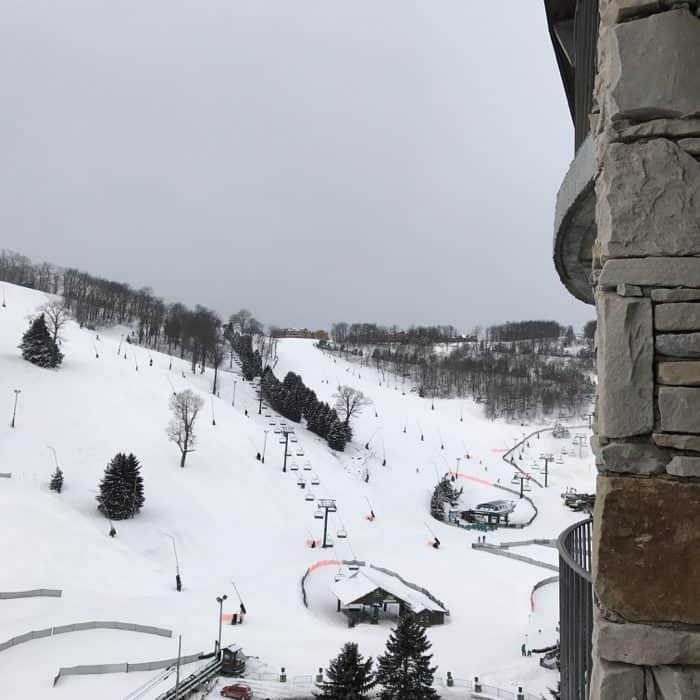 Hidden Valley Resort offers snow tubing as another fun option for your visit. 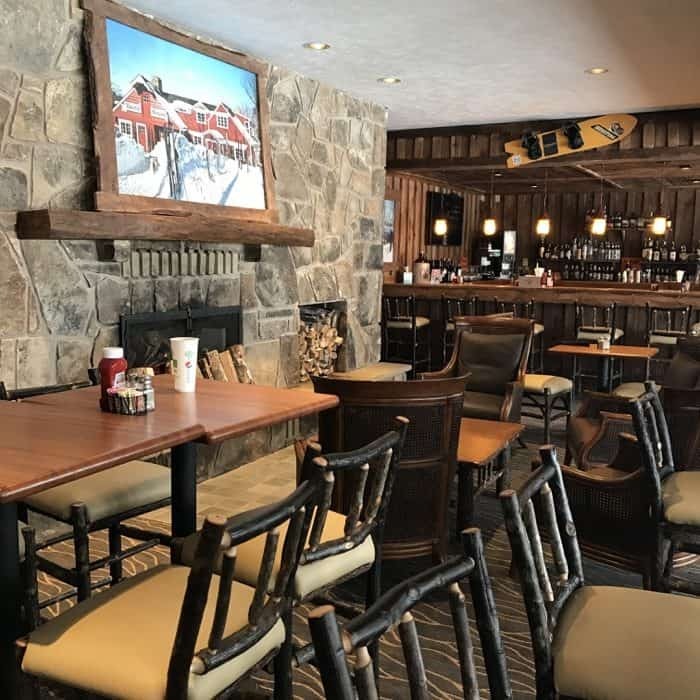 You have three options when it comes to dining onsite, the Sunrise Sunset Cafe, Glaciers Pub and the Clock Tower Restaurant where you can grab a quick bite to eat or linger after a day on the slopes. Make sure that you try the broccoli cheddar soup if it’s the soup of the day. It’s wonderful! 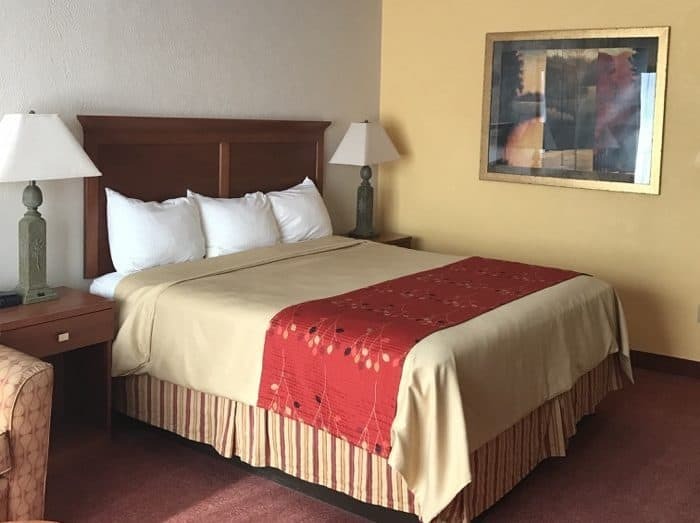 Lodging options are the nearby Inn at Hidden Valley or vacation rentals. 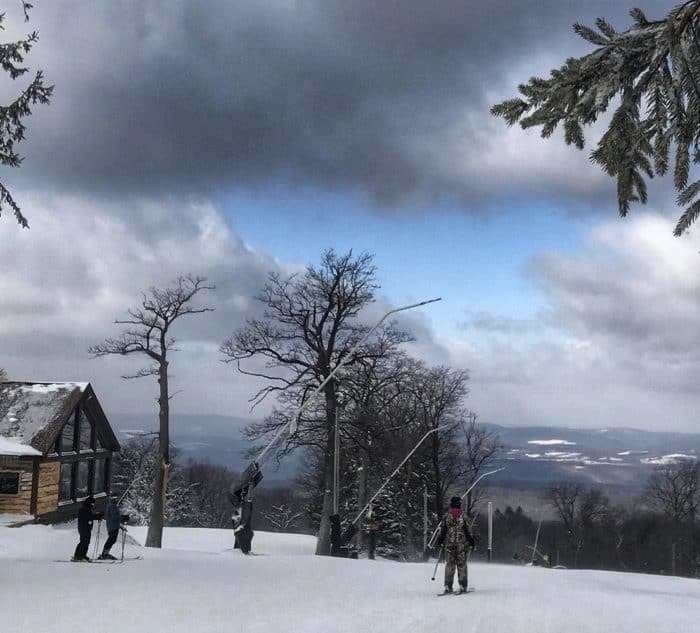 I would describe Laurel Mountain Ski Resort as a hidden gem. The lodge is located at the top of the mountain which offers a unique perspective of the slopes. 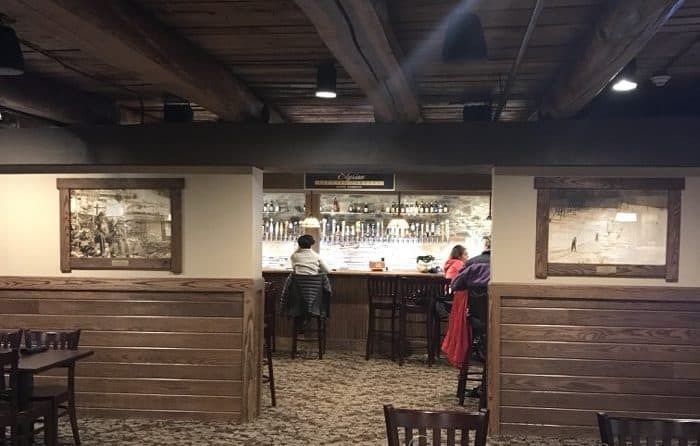 The vibe inside of the lodge is more intimate with a large fireplace and tables. Upstairs there is the Laurel House Cafe and downstairs there is a restaurant/bar “The Wildcat Lounge” with another fireplace and plenty of seating and tv’s to catch the big game. During our visit they were playing Crooner music upstairs, which put me in a happy mood and in another time period. 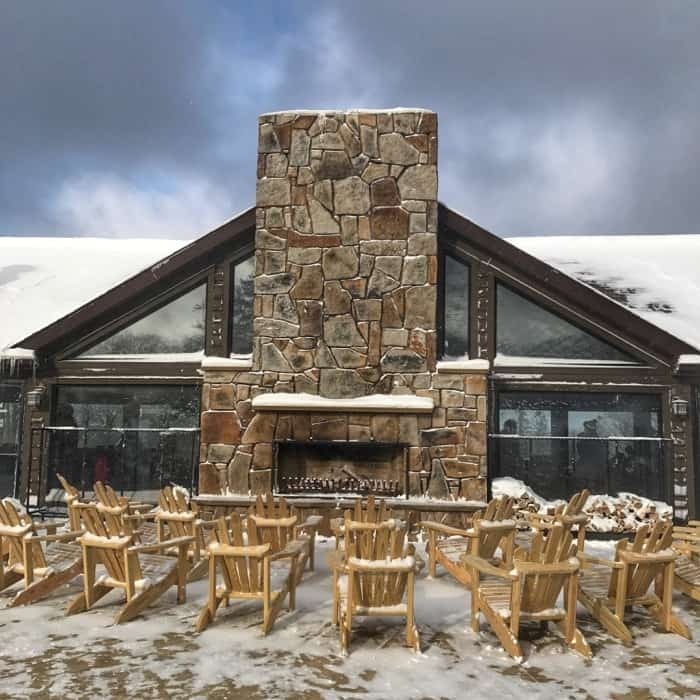 I would highly recommend visiting this lodge even if you are not a skier because of it’s cozy atmosphere that feels like an escape from the world. 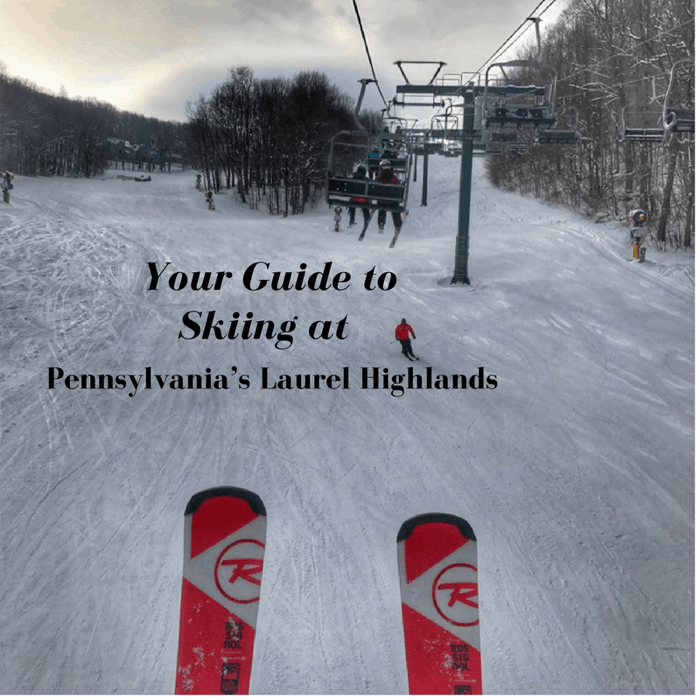 Laurel Mountain Ski Resort resides on Laurel Mountain State Park and has a unique history. The original design of Laurel Mountain was created by the Austrian ski guide who invented the modern alpine ski technique, Johann “Hannes” Schneider. 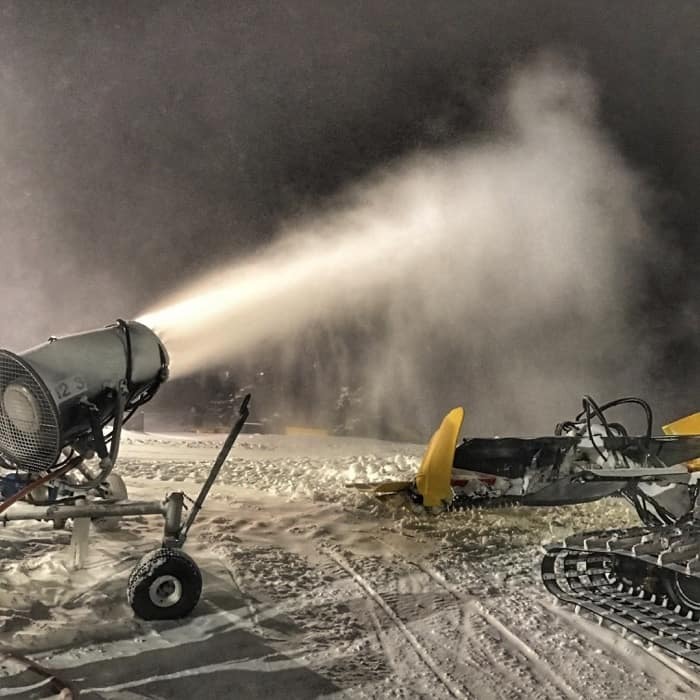 Laurel Mountain was also among the first ski resorts to install large scale commercial snowmaking machines in 1956. Over the years it faced ups and downs, along with ownership changes. It reopened for the 1st time in over a decade during the 2016/2017 season which means that guests will enjoy brand new equipment rentals. 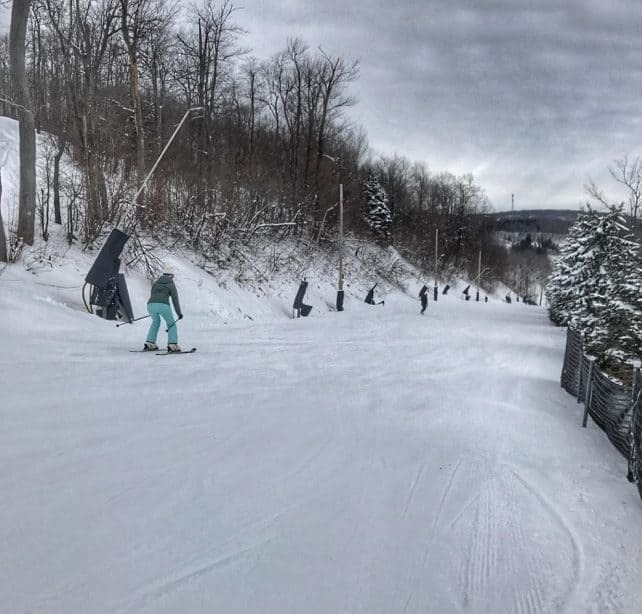 Laurel Mountain has 20 slopes and trails. I would say that this resort is best for moderate to advanced skiers. The views from the trails are absolutely breathtaking and peaceful! 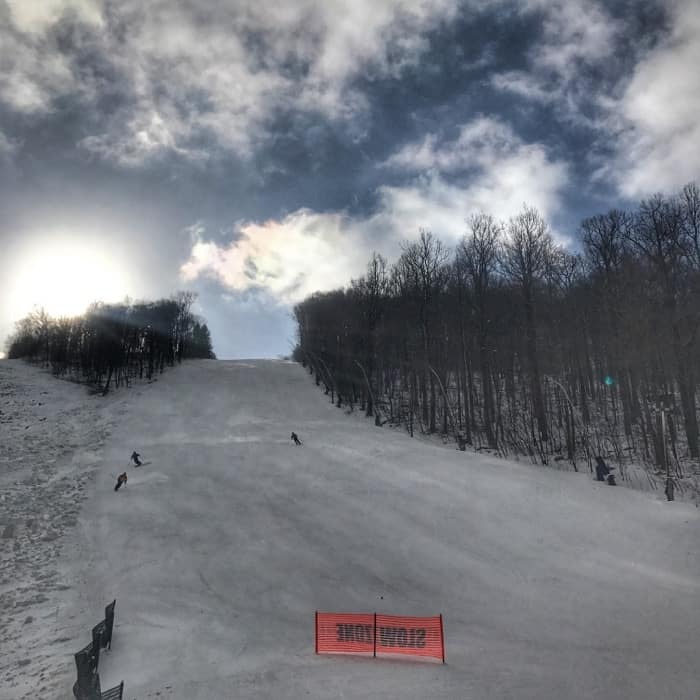 Newer skiers can take advantage of the private and group lessons available for all ski or snowboard levels of ability. 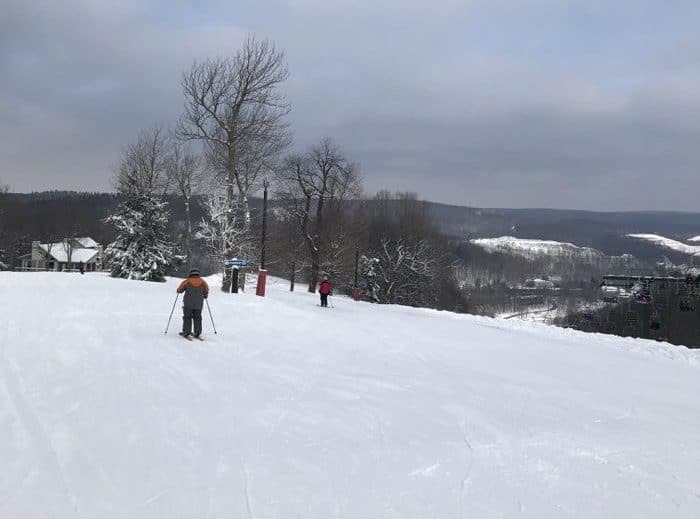 Laurel Mountain has bragging rights with the highest vertical drop on the Laurel Ridge in Pennsylvania at 761 feet, steepest slope in the state on double diamond Lower Wildcat Slope, which averages near 60% slope! (No, I did not try it, but I do know someone who did! )..and no they did not need medical attention. 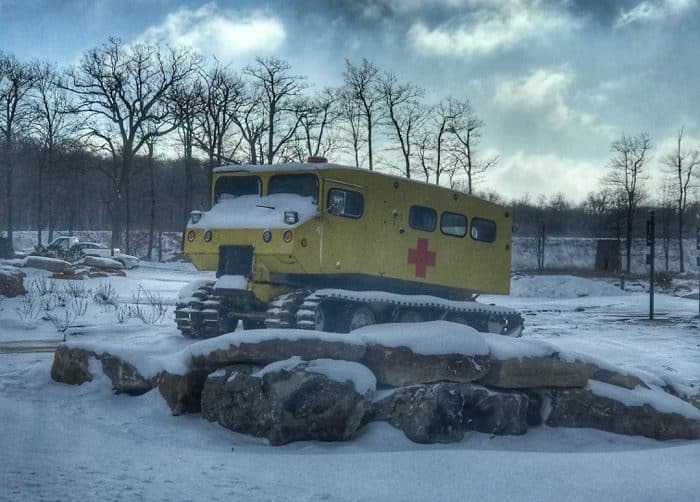 I just thought the vintage medical snowcat was cool. Laurel Mountain does not have overnight accommodations onsite and guest are encouraged to take advantage of The Highlands Package. 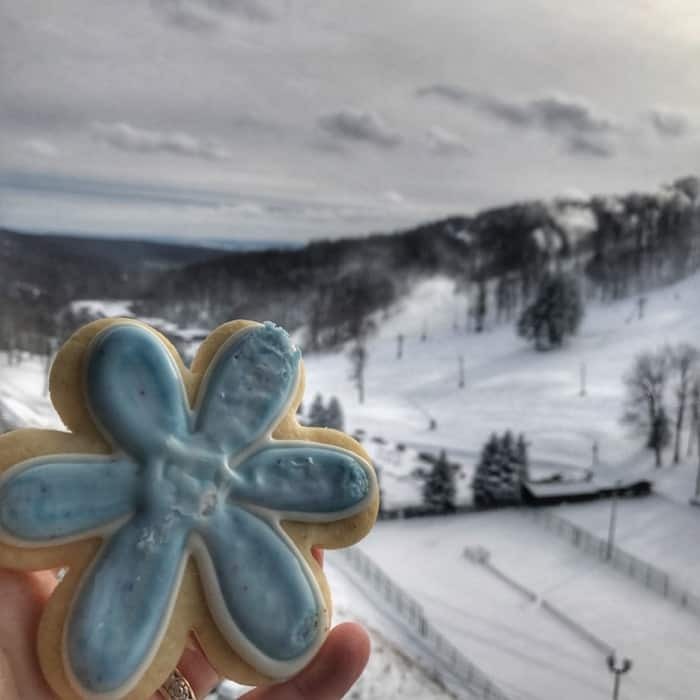 The largest of the Laurel Highlands trifecta, Seven Springs Mountain Resort has 285 acres of skiable terrain with 10 lifts, seven Terrain Parks and 33 slopes and trails! 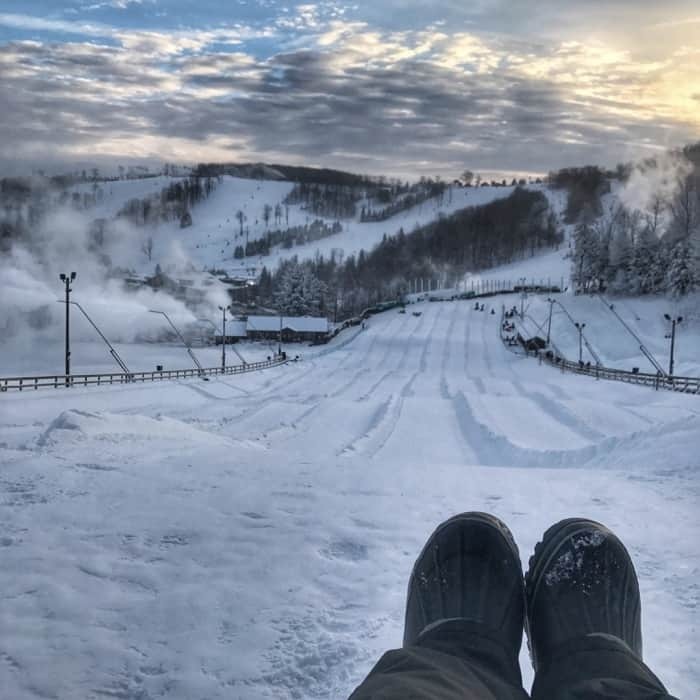 Seven Springs’ snow tubing park is the largest snow tubing park in the region (minimum age is 4.) You have plenty of time to do as many runs down as you want thanks to the moving carpet that brings you back up the slope. Ride single or join with a few others to increase your odds for some air time on the way down. 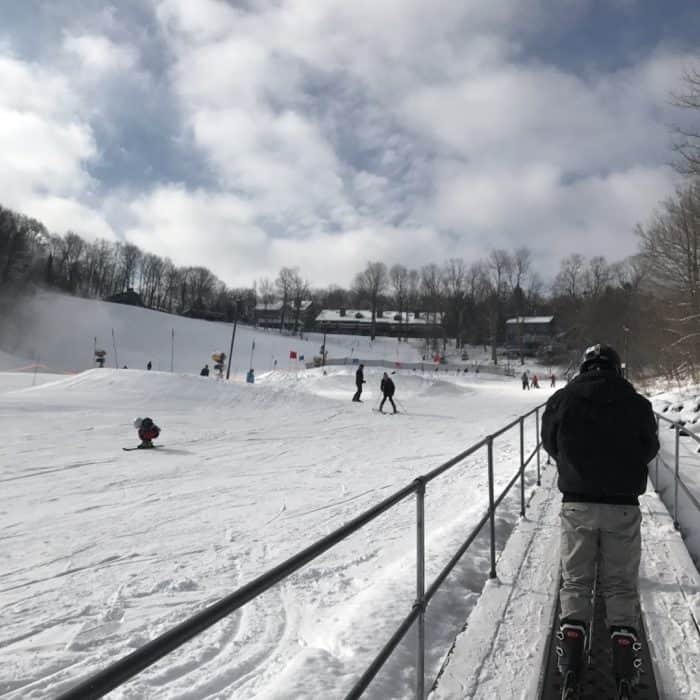 Probably the best part about skiing or snowboarding at Seven Springs is that you can choose your own adventure with so many run options available for every skill level. I enjoyed relaxing down the mountain as I went my own pace on the longer runs. There are plenty of challenging runs and opportunities to try new tricks at the terrain park too. Fun Based Learning lessons are also available at Seven Springs. 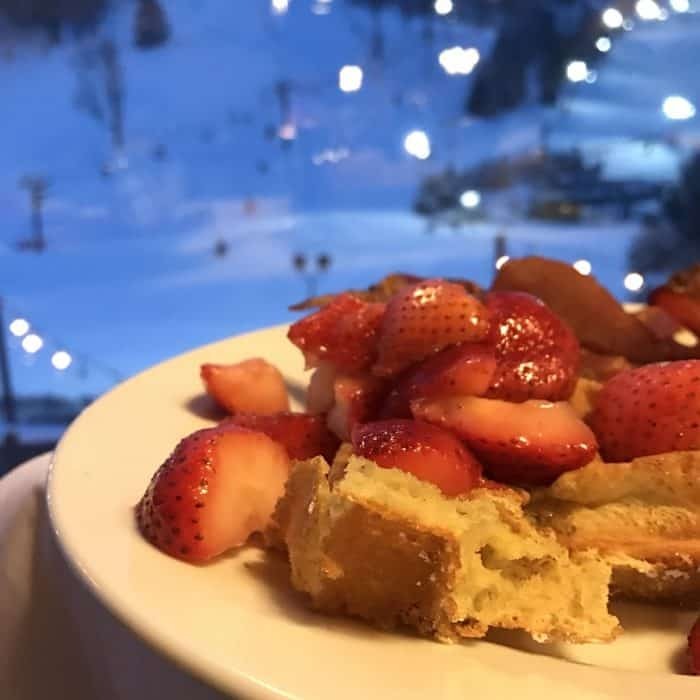 If you stay at Seven Springs, you will appreciate the breakfast options and the view at Slopeside. 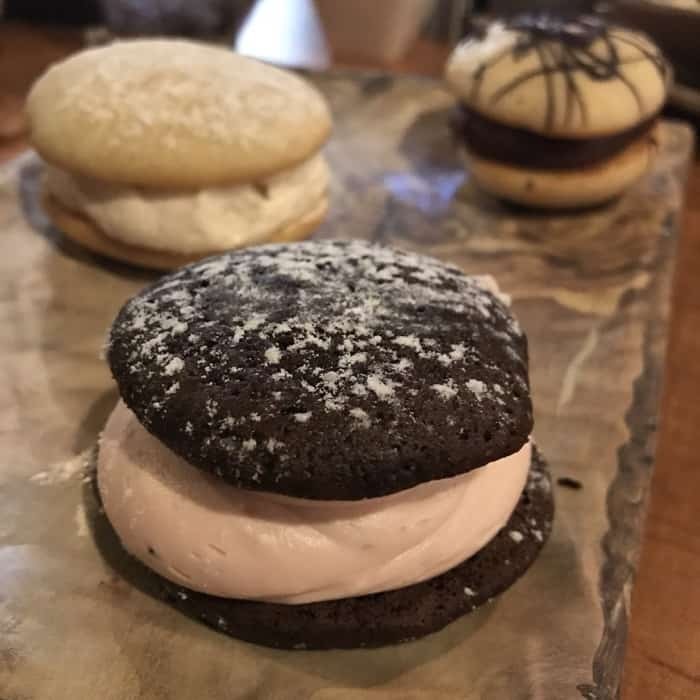 There is a pastry chef onsite and you can taste the difference. You will still find plenty of other options if you enjoy savory over sweet options. If craft beer is your thing, you will love Foggy Brews with 50 crafts and taps from around the world. 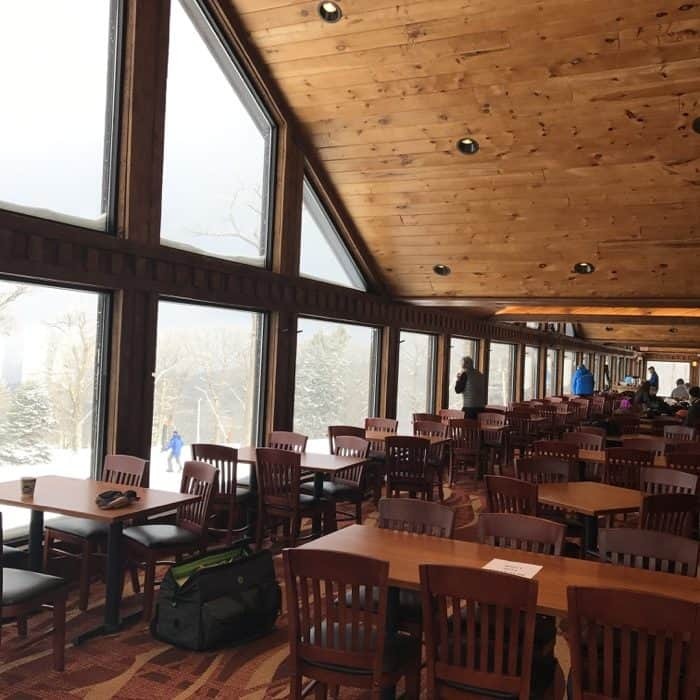 It’s located on the top floor of the Ski Lodge and it’s also THE place to be. 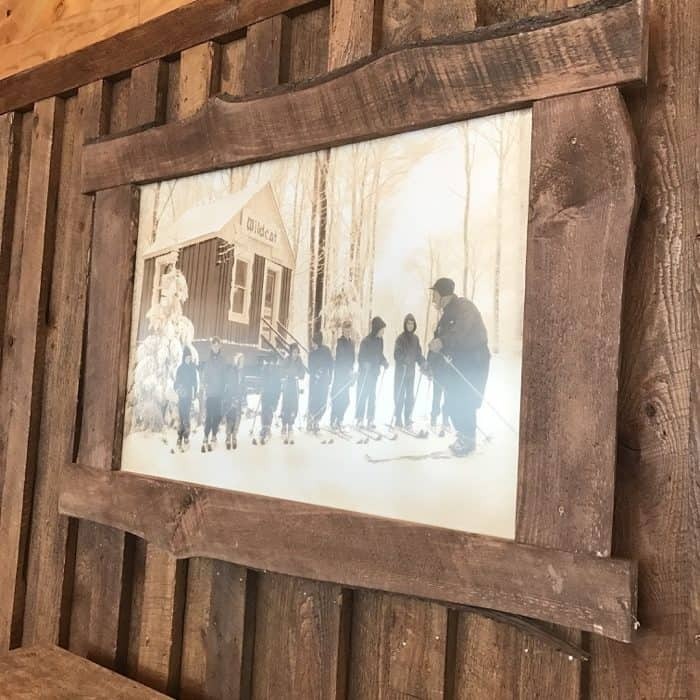 The photographs on the wall are from Seven Springs all the way back to the 1950’s. There is plenty to do if you want to take your adventures indoors. 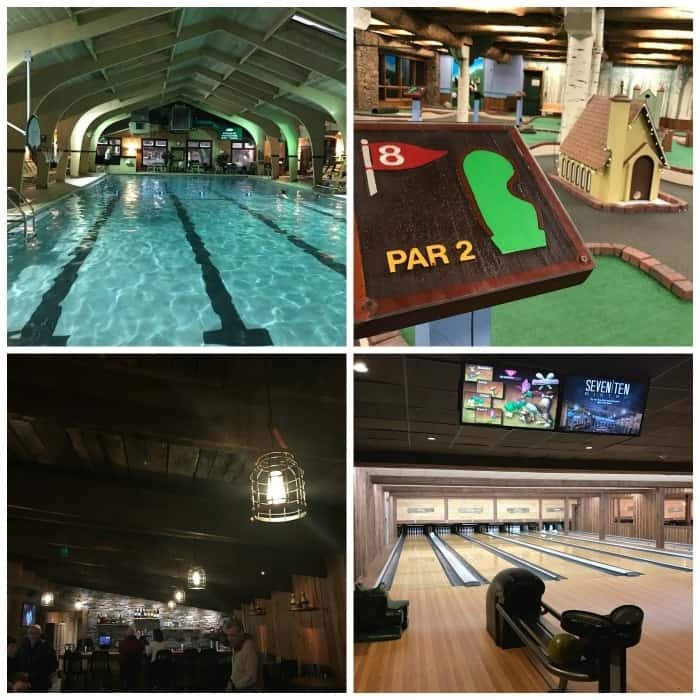 The resort offers bowling, swimming, mini golf and an arcade. If you want more winter adventure, there are sleigh rides, snowmobile, snowcat and snowshoe tours. We had the opportunity to experience a behind the scenes tour of the snowmaking and snowcat. 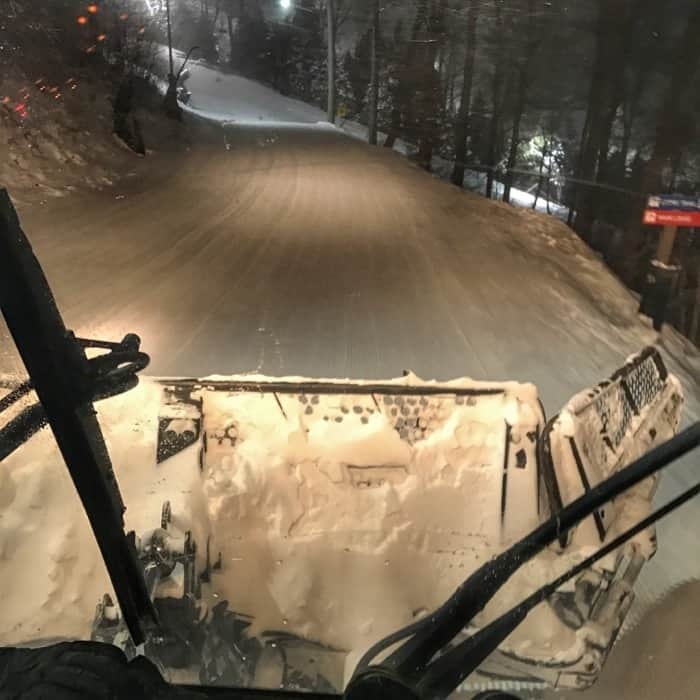 You seriously will want to take the snowcat tour! It gives you a whole new appreciation for the crews that work on the slopes at all hours of the day and night. As a year round destination, guests can also try sporting clays. In the warmer months there is a zipline course too. Guests staying onsite will love the close proximity to the slopes. 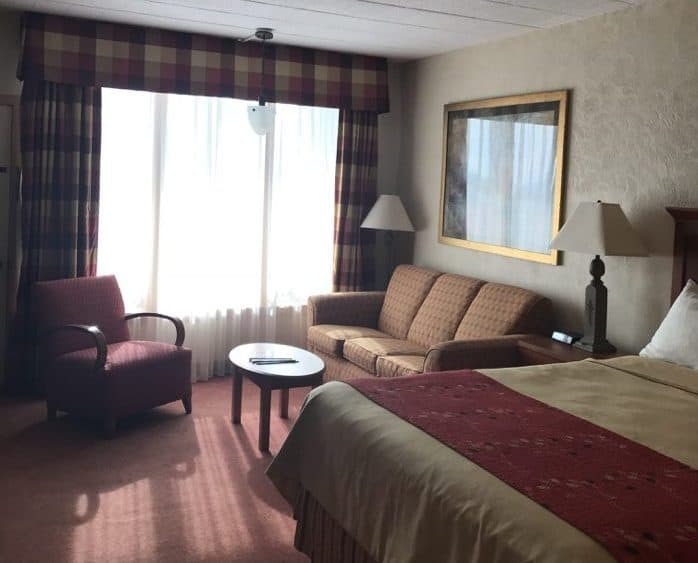 If you stay at the hotel, it’s important to remember floor number 4 because it will take you to most of the areas that you need to be throughout the resort. The resort is HUGE due to several additions over the years. 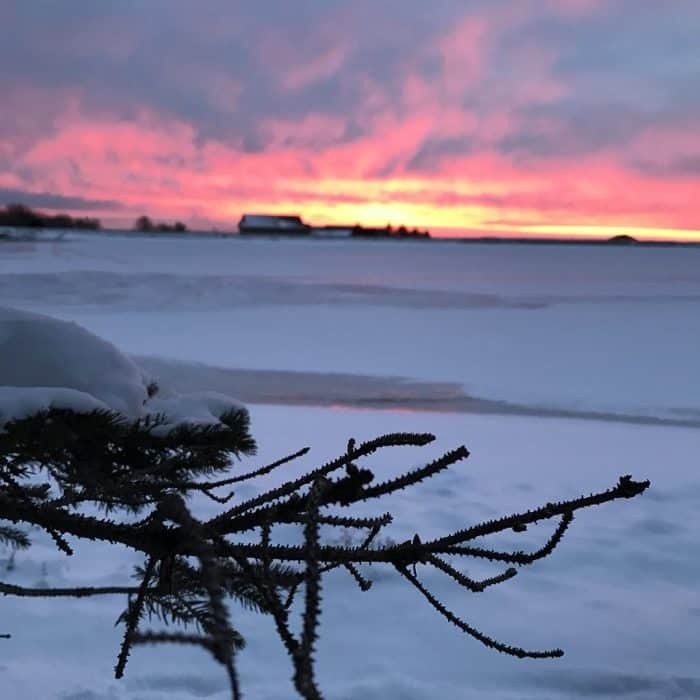 There are also 15 chalets, 11 cottages, nearly 1,200 condominiums and townhomes, in addition to the 414 hotel rooms which means that you have lots of options for accommodations. . I loved that our room had hooks for all of our snow gear and a balcony facing the slopes with all of the action. If you are a really light sleeper like me, I would suggest downloading a sound machine app so that you don’t hear the crews grooming the trails overnight. Once I heard the beach waves in the background from the app, I was good to go. If you have the opportunity to wake up before sunrise, I recommend taking a drive to the top of the mountain for some pretty incredible views. Why choose when you can ski at all three! I really enjoyed my visit to all three resorts and I think that each offers a unique experience. If you don’t want to choose, the Highlands Ticket is a great option. One ticket, three great mountains! 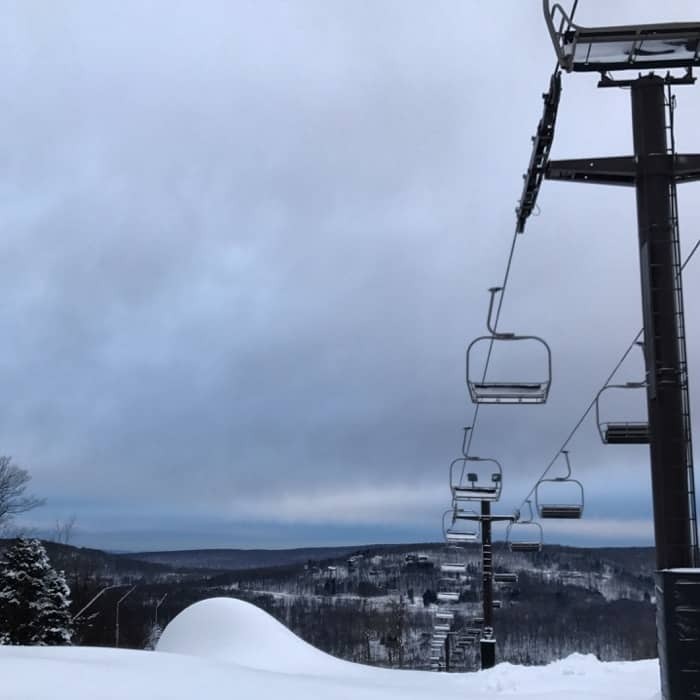 The Highlands Ticket offers skiing and snowboarding at Hidden Valley and Seven Springs Mountain Resorts in the Laurel Highlands and is the best offer for snowsports enthusiasts. New this year, the Highlands Ticket is bigger and better than ever! Enjoy unlimited skiing and snowboarding at Laurel Mountain, too! 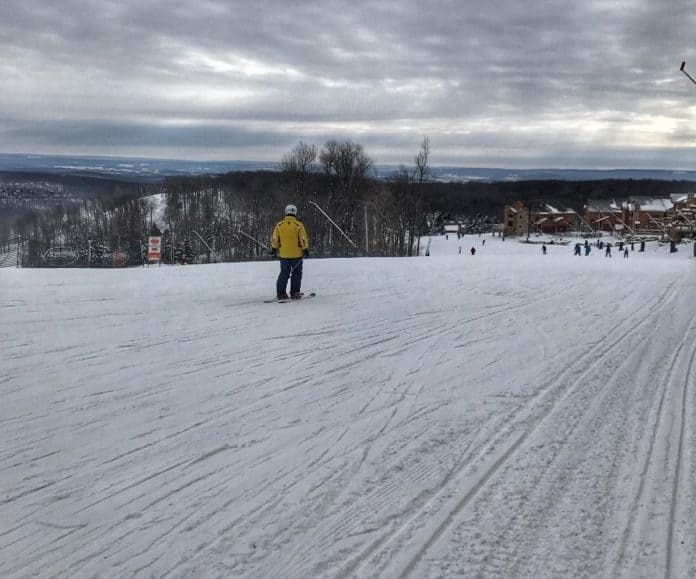 That’s THREE mountains of winter fun in the Laurel Highlands! We really enjoyed our visit and I can’t wait to come back again with my kids. Our biggest regret was having to leave because we were having so much fun! A 5 hour drive is definitely a doable roadtrip for our family! 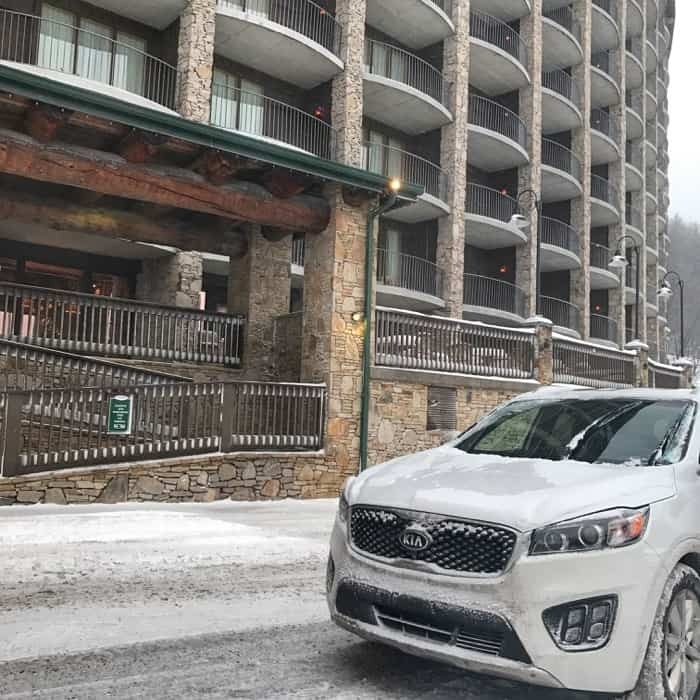 Thanks again to Laurel Highlands Visitors Bureau for hosting our visit and Kia for providing a Sorento for our road trip. 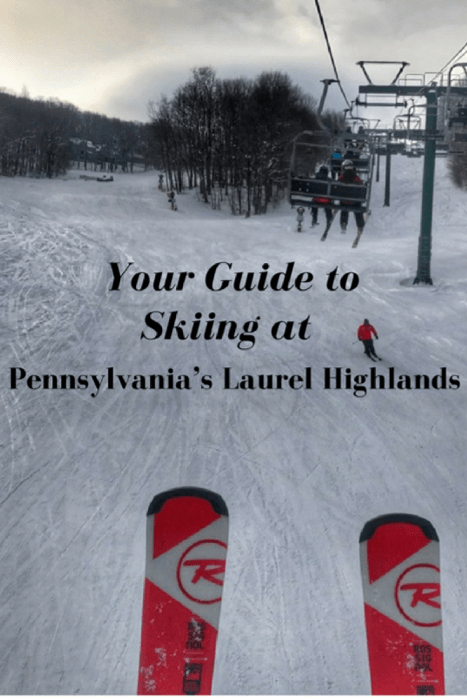 Why wasnt Nemacolin included in the Laurel Highlands review? What a shame. Its amazing.